800 years ago today, on 30th September 1207, the mystical poet Rumi was born. 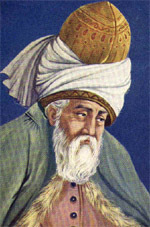 Rumi’s wisdom on spiritual themes was widely referred to in Persian literature and literature from other parts of that region, his poetry has also become famous around the world and has more recently been incorporated into some pop songs, such as Bittersweet by Madonna in 1998. There is an article about Rumi’s birthplace here on the BBC News website. Rumi is referenced several times in what Shoghi Effendi described as Baha’u’llah’s “greatest mystical composition”, The Seven Valleys, as well as The Four Valleys which is usually published along side The Seven Valleys. Both of these scriptural works offer mystical insights into themes of spiritual search and progress and were written in response to questions posed to Baha’u’llah. Love’s fool am I, in all the earth. Though I once came first for wit and worth. Thou the Piper, I the reed. Through me blow Thy holy breath. To me, who’ve lain an age in death. And yet in every eye dost dwell.